Progger, Cycles, and Purple Bee Crew All Star's! TIX :: On Sale TOMORROW, Tuesday, 1/3/18! What began as a jam session at a rehearsal space in Austin has become a tri-coastal collection of gifted music-makers whose captivating live performances and studio releases have garnered acclaim from fans and publications around the world. Progger is held together by a passion for music that balances sophisticated harmony and melody with visceral beats and riffs. Through four critically-acclaimed releases and live tours supporting acts like Parliament/Funkadelic, Snarky Puppy, Ghost-Note, and the Funky Knuckles, Progger has developed an international following of devoted fans. Cycles epitomize the power-trio format with ripping guitar, fat bass grooves played out through furious slapping, and dynamic drum beats flowing over intricate tempo changes. Each member wields a unique take on their instrument that when played together, forms a truly fresh and cohesive sound. Patrick Harvey commands the guitar with speed and precision reminiscent of Jimmy Herring while using his loop pedal virtually as its own instrument, a skill unique only to him. Michael Wood has subtly forged a drum style that showcases his rare ability to mashup funky hip-hop beats with frenzied rock riffs and only displays flashy technique when necessary while implementing the creative use of various sound-modulating drum triggers. At the heart of the band lies Tucker McClung's dominant slap-bass chops that captivates audiences and pumps the musical blood through the band. Enter The Portal - a full show of completely improvised music. 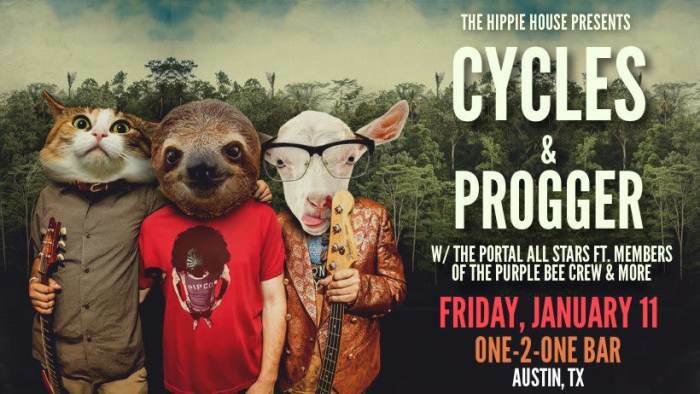 This is not an 'open mic' or a 'blues jam' - this is an expertly curated and conducted improvisational set - it will feature members of Austin's hottest jam bands.